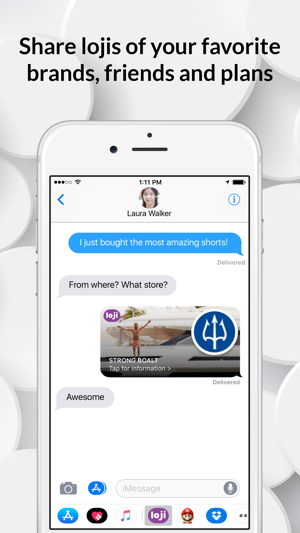 Loji interactive icons are the fastest way to find and share useful information, without leaving iMessage. Access details and real-time updates on your favorite people, places and things. Empower your search experience and make better connections to what you love. Tap a Loji icon to instantly access the most useful information – all in one place. 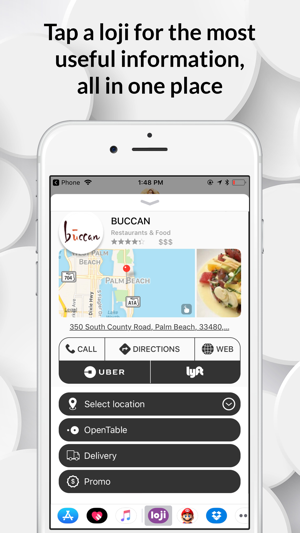 Contact information, maps, reviews, social media feeds and so much more are right at your fingertips. Need an Uber to get across town? Craving Chinese delivery? Take action, and tap a Loji. 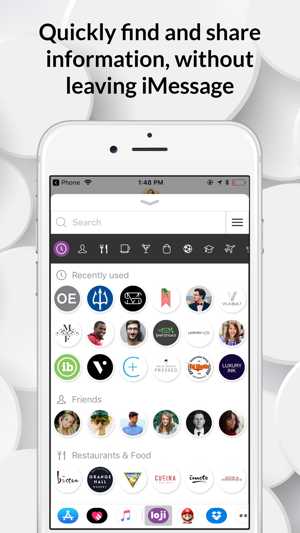 Easily find Lojis of your favorite brands and friends by viewing our custom image-based library within iMessage. Your most frequently used Lojis appear first in your library, so you can always quickly find what you’re looking for. Filter by category to help narrow your search or discover something new! When your Facebook and Instagram connections sign up for the app, they auto-populate as Lojis in your library. Make sure to connect both accounts when you set up your profile. Once you sign up through Facebook or Instagram, your profile picture becomes your own customizable Loji! 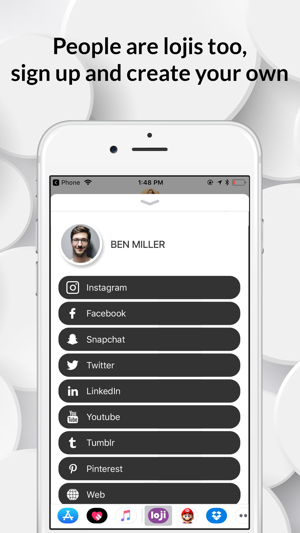 Add your other social media accounts to personalize your Loji profile page. Now you can see and share all of your accounts in ONE place. Send Lojis of people to make an introduction or get the scoop on your latest right swipe. Can’t find a Loji? No problem. All it takes is a simple one-step process to request new Lojis of your favorite brands. Help us grow our library by adding and sharing Lojis of what really matters, with the people who matter to you. 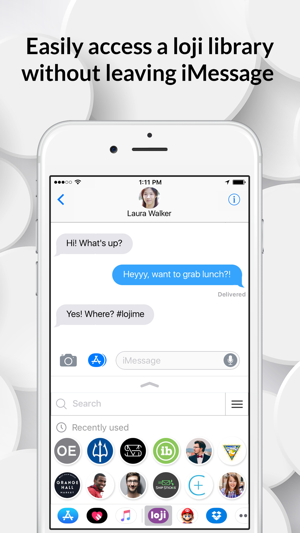 You can now find all the information you need and more in without leaving iMessage. Get to tapping and download Loji today! Questions? Comments? Want to add a Loji? Ideas to make Loji better? We want to hear from you! Please visit www.goloji.com or shoot us an email at info@goloji.com. Improved user experience and performance updates for iOS11. We want to hear from you! Please send suggestions to info@goloji.com. Have been using the app to help plan my days and nights. 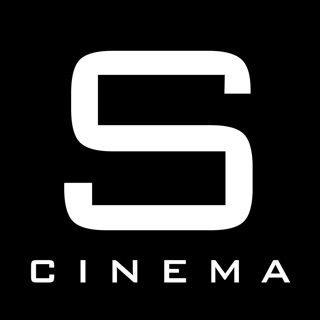 If I just want to meet up with friends for dinner or cocktail hour, I can check out info on the place and just send the logo in imessage. Can't stand long, drawn-out text convos, so I'm a fan. Just when I thought iMessage was complete!!... Now this"Loji"!.... Gotta try it!